This Sleigh Bed with Leather Upholstered Headboard 298-470+463 is part of the Rodea collection finished in dark Cabernet. 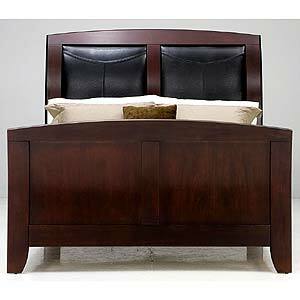 The beautiful curved headboard with black leather insets and curved footboard make it a contemporary and unique alternative to the traditional sleigh bed. 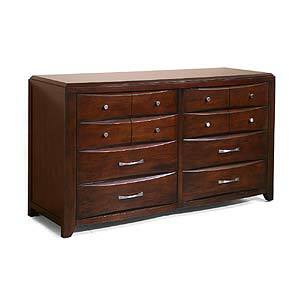 Dimensions: Width (side to side): 69" Depth (front to back): 95" Height (top to bottom): 61"
This Eight Drawer Dresser 298-458 is part of the Rodea collection finished in dark Cabernet. Eight drawers give you plenty of clothing storage for your bedroom. Beautiful curved drawer fronts make it unique and functional. Dimensions: Width (side to side): 69" Depth (front to back): 24" Height (top to bottom): 38"
This Platform Sleigh Bed with Leather Upholstered Headboard 298-465+416+423 is part of the Rodea collection finished in dark Cabernet. 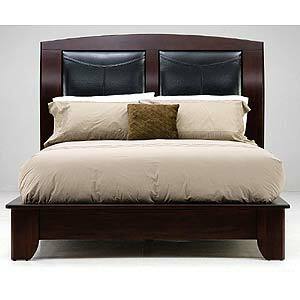 The beautiful curved headboard with black leather insets and low platform profile make it a contemporary and unique alternative to the traditional sleigh bed. Dimensions: Width (side to side): 71" Depth (front to back): 94" Height (top to bottom): 61"
This Dining Side Chair 298-140 is part of the Rodea collection finished in dark Cabernet. Beautiful leather upholstered seats, and unique curved lines and diamond veneers on the back give the dining chairs a contemporary yet formal feel. Dimensions: Width (side to side): 22" Depth (front to back): 25" Height (top to bottom): 42"
Complete your dining room setting with this rectangular dining table for an elegant style. 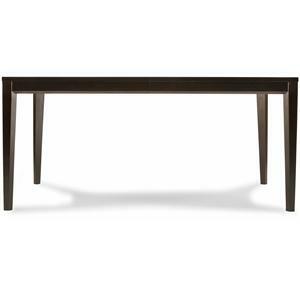 Finished in a rich, dark chocolaty birch color over birch veneers, this piece features long clean lined tapered legs, thick top molding, and a removable leaf for table extension. The pure comfort and traditional style of this dining room table will allow you to continue your dinner conversations for hours. 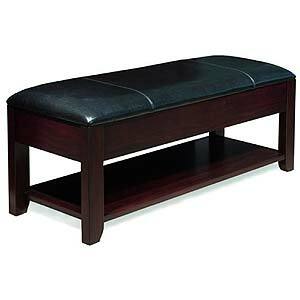 This Leather Upholstered Bench 298-450 is part of the Rodea collection finished in dark Cabernet. Providing the perfect place to sit when putting on your shoes or when getting ready in the mornings, this bench is both functional and stylish. A lower shelf gives you storage space too. 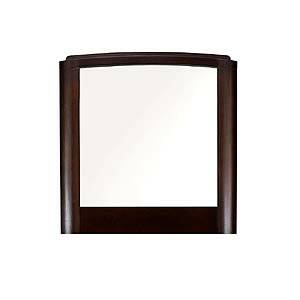 This Dresser Landscape Mirror 298-401 is part of the Rodea collection finished in dark Cabernet. Reflecting light and adding polish to your bedroom, it is also convenient for getting ready in the morning amidst the hustle and bustle. Dimensions: Width (side to side): 42" Depth (front to back): 2" Height (top to bottom): 43"
Gather your family and friends around this stylish modern table for the perfect place to enjoy a meal together. Ideal for a breakfast nook, this round table has modern attitude that you are sure to love. 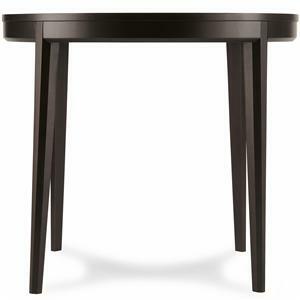 Tapered feet show off the crisp clean lines of this handsome table. A dark birch finish over the birch veneers finish off the piece for elegant completion. 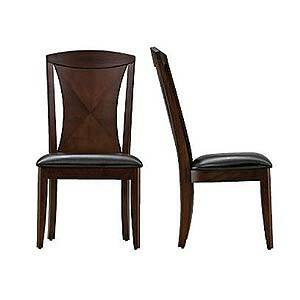 Pair this table with cafe chairs from this collection for a beautiful set. 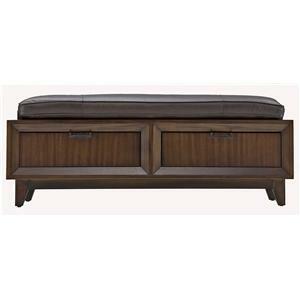 The storage bench features a highly modern style with clean lines, a minimalist body, and an upholstered seat. Whether draping clothes or used as an additional seat, the bench will add a sophisticated flair to any bedroom. 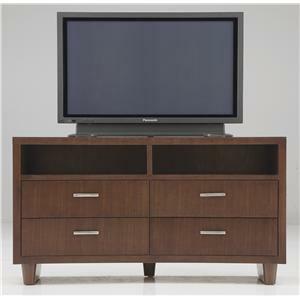 It features two storage drawers to store blankets, clothing, shoes, accessories and more.